In To-do List Training you will hear a series of instructions to retrieve specific objects in a specific order. Listen carefully and remember the order the objects were requested. You will then be presented with a grid of objects. Your task is to find the objects following the order given in the instructions. When you click “START” you will hear a series of instructions. Listen to and remember these instructions. 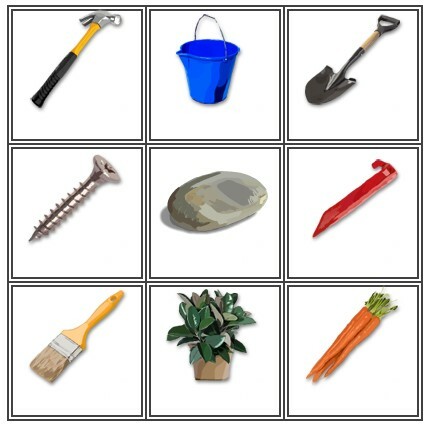 You will then be presented with a grid of 9 objects similar to the screenshot below. Click/touch (in case of touchscreens) on the objects you were told to retrieve in the instructions following the order requested. As you retrieve objects, new objects will appear and take their place. As new objects appear to fill in the grid, objects will also shift in position. There is no guarantee that the second or third objects in the instructions will appear on the initial grid that is presented to you. If you don’t see the object you are looking for, it’s most likely because you have made a mistake in the order you need to perform the tasks. The number of instructions given will increase. "…before getting the shovel, you’ll need the rake and then the hammer"
"…get shovel A and then rope B before you get plant C and bucket A"